The Little Girl with the Big Voice on PBS! Excited to learn that my documentary “The Little Girl with the Big Voice” was featured on Rhode Island PBS a couple weeks ago!!! The Little Girl with the Big Voice by Rafael Moscatel examines the struggles of women and children in the early 1930’s and 40’s through the eyes of Mary Small, a child prodigy, restless wife and dedicated mother whose resilience in the face of constant challenges made her a defining symbol of her generation. Although she was undoubtedly one of the most recognizable stars of the Golden Age, she disappeared an unknown, became a ward of the court and her possessions were discarded in the city dump. She never received so much as an obituary. This film by her long lost grandson attempts to finally right that wrong. Winner of Best Short Documentary at the Burbank International Film Festival (2015), Official Selection Flickers Rhode Island International Film Festival (2015) and Official Selection of the New York Independent Film Festival (2015). VINCENZA D. – I loved Mary like my musical mother and I was heartbroken for her that when she was ill, she felt no family was willing to help her. I was honored to fill the gap while I could. I am so pleased to see that you are honoring her memory. She so deserved it. Mary was a strong lady but she suffered a great deal of loss as you know. I fell in love with her from the first phone call. She was spunky and confident and said she had just come from buying up all the shoes in town.Being with Mary was like entering a time machine. She transported you to a magical world of yesteryear. It was a great place to be. Mary loved Nancy LaMott by the way who is now one of my favorite performers (died tragically of cancer). She also loved Streisand. She liked Sinatra’s storytelling in his songs but felt he was overrated. DONNA S. – My name is Donna S. Your grandmother was my voice teacher when I was21 years old for about a year. She lived uptown on the west side in the 70-80 streets. She was quite the fireball!! She had a tough Broadway voice. I loved her! My favorite song that she taught me was, The best in the world, which I just shared today with my 16 year old daughter. I just started looking up your grandmother and I found your wonderful story. Mary had so much sheet music in her apartment!! She had me rehearsing weekly so I could be on the Joe Franklin show and after a few months your grandmother and I got on a bus and went to the live Joe Franklin show! I was petrified. She looked great! She had her high heel pumps on and a dress, she did her hair and her makeup nice ! She was so excited to bring one of her students with her to his show. I didn’t ge to sing that day but we had a blast! The lovely Eleanor Vallee gave me this interview about Rudy Vallee earier this year. 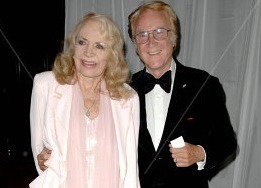 Below is a recent photo of her with Byron Clark, an actor and also a great guy. Very sorry to update this post with notice of the death of Eleanor Vallee, author, entertainer and partner of Byron Clark and widow of Rudy Valle. This post includes outtakes of my first interview with her in 2013. Rest in peace Mrs. Vallee. Big thanks to H. Kevin Miserocchi of the Tee and Charles Addams Family foundation for this nice gift, a limited edition reissue of the Addams Family television soundtrack, and also for the nod to Mary Small on the liner notes!!! A great way to begin wrapping up a great journey, and nice to know the story of these talented entertainers continues to live on! Studio City Film festival was great!!!! Thanks to everyone who came out for it!